SPECS: Fits 9mm AR-15 rifles that accept Colt style magazines. Body – Steel construction with a matte black Xylan finish. Follower – Steel, round. Spring – Extra power steel. Floorplate – Removable steel. Spesifikasjoner: passer 9mm AR-15 rifler som godtar Colt stil magasiner. Kroppen-stålkonstruksjon med en matt sort Xylan finish. Tilhenger-stål, runde. Våren-ekstra drive stål. Floorplate-flyttbare stål. These mags fit snugly in my RRA 9mm lower, better in fact then the RRA mag that came with the rifle. Very good quality construction! These shot with out a single issue. Worked as good in my M16 full auto Colt 9mm as well. Will never buy another $100 Colt mag again, there identical. Except these mags have a better coating then the Colts! Hard to find anything to complain about. They feed 100%, they're very well built, with steel followers, the finish looks great and they fit in my GPI 9mm lower perfectly. Decent price too, I'm ordering more shortly. Also fyi, these fit perfectly in a surplus Uzi mag pouch. Great product, on par with factory Colt magazines albeit with a different finish. So far are functioning perfectly with Hahn Dedicated conversion block in an Andersen receiver. Unlike other mags theses are VERY easy to load and shoot perfect. These are the very best mags that you can use for the 9mm AR. They are the best quality I have ever saw. I have Colt mags also and I like these better. Great Mag. I'm running these magazines with a PSA upper assembly and bolt, and a PSA drop-in magazine block in an Anderson lower receiver. I actually expected a few break-in bobbles, but the gun never missed a beat using these magazines, and everything was utterly reliable. The coating used on these mags makes cleaning a breeze, and they are actually pretty easy to load by hand without a loader of any kind. I can't recommend them highly enough. I've been running these with a Hahn's dedicated conversion block, CMMG enhanced bolt, Wilson barrel on a RRA upper, and Spike's lower. They work great, no problems at all! Very high quality construction. Tried to stuff a full magazine into a 9mm CMMG build with the bolt closed during an unloaded table start at a local USPSA match. Pulled the charging handle and rounds came flying out of the ejection port. Dumped the mag and more rounds fell out of the magwell. Very disappointing. When loading the rifle with the bolt open the mags work perfectly. Oh well, for the price the mags work well. Just don't try to load a rifle with the bolt closed. I use these in an SBR I built using a Bushmaster lower, a Hahn top loading conversion block and CMMG upper. I have tried ASC and ProMag magazines as well and found that they were greatly inferior to the Bushnell product. The most notable difference is that the ASC and ProMag mags will not lock the bolt after the last round is fired. The Brownell's mag does. It is also easier to insert and remove. 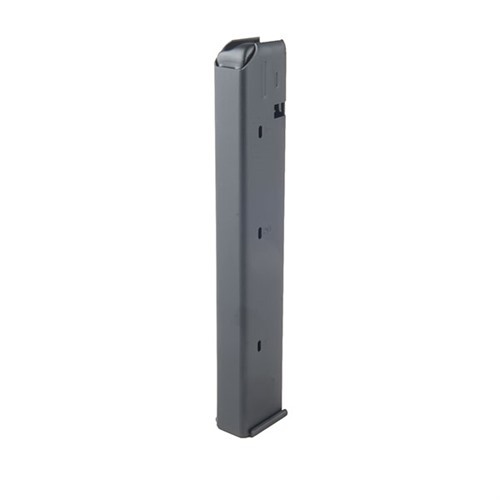 One point of caution is that you do need to give it a firm slap upon insertion, particularly if the bolt is closed, otherwise you might encounter problems with cartridges being stripped from the mag. I wish they made a 10 round version that I could use when shooting prone. Used these with Brownells 9mm barrell, Hahn top loading conversion block, 7.5 oz 9mm buffer and heavy buffer spring. (also used lighter spring and lighter 9mm buffer). Fit and finish was A+. I noticed before using that if only one round was loaded it seem unstable in the magazine. 1st magazine ran 100%, no issues. The other two would occasionally jam on last round. I loaded 3-5 rounds and could not get the 1st mag to jam but kept getting occasional last round jams with other two. Only last round. I suspect the follower may have been out of spec. I bought a cheaper brand mag with an orange follower. Last round was much more stable. I had to remove a little bit of plastic from the front of the follower to clear the Hahn conversion block. Fit and finish on cheaper ones was not near as good as Brownells but I have not had any issues with the cheaper ones after follower modification. 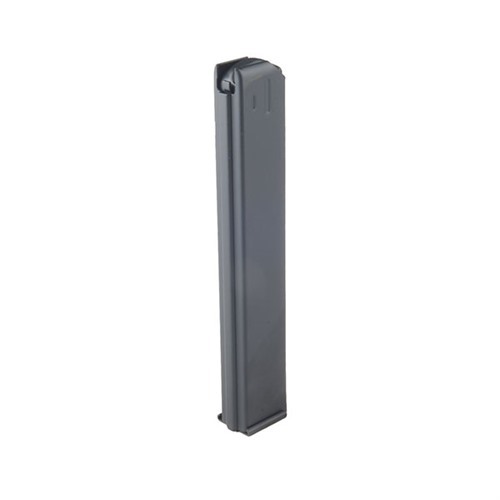 I would suggest Brownells research switching to polymer follower like the majority of 5.56 magazines. Hope this helps anyone who may have a similar problem. Brownells took these back with no questions. A+++ on customer service. I currently own 6 of these mags. They look to be identical to my metalform mags and they are well built. The exterior coating is superior; feels great and prevents rusting. I had an issue where initially a few mags would have feeding issues on the last round. Ended up taking off 1-2mm of material off the last round hold open tab on the magazine and they were good to go. Only 2 of the 6 mags had this issue. Would definitely buy again just for the coating. Purchased the 3 pack for my AR-9 build. All mags worked flawlessly with the dedicated spikes lower I have. LRBHO functions 100%, no feed issues whether fully loaded or not. Decided to go with the Colt style mags for appearances and functionality, I am not disappointed! Flawless function at a great price. These things are the real deal for SMG builds. Thanks Brownells! I bought the 3 pack while they were backordered because of how well these reviewed. Once I got them in and took my new build to the range, all 3 produced nothing but failures to eject. I'd get 1-2 round off tops and then it would jam in the chamber. Switched to my single ASC magazine and the gun functioned flawlessly no matter what ammo I used in it. While the magazines were loaded in my hand I was getting double feeds pushing them out by hand in all 3 while my "junk" ASC did not do this. Nor was there play in the rounds in the budget magazine like there was in my Brownell branded Metalforms. I'll give these 5 stars for their performance to date. 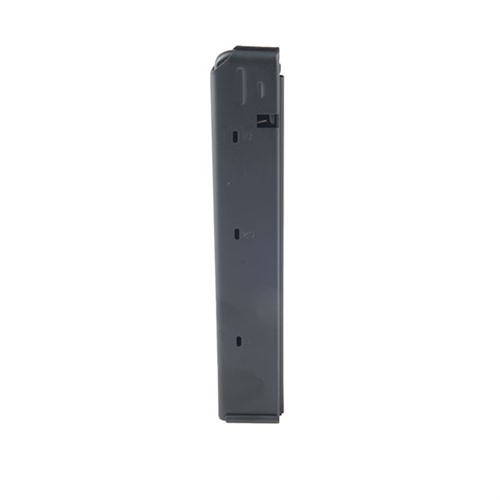 I purchased 5 of these mags and have run all 5 through a couple of 9mm ARs, one w/ a conversion block and the other a made-from-ground-up Colt 9mm. No drips, no runs, no errors, so far with these mags -- perfect fit, feed, and function. If you want to pay $100/ea for Colt mags -- be my guest. I've got several and if/when I sell a 9mm AR Colt -- I'll put "original" Colt mags with the arm for obvious reasons. But for day-to-day operation? I'll go with these magazines that are apparently as good as Colt without the exorbitant price tag. These Brownells magazines work great in my 9mm AR. I have had lots of problems with other brands. Ran two full magazine runs, rapid fire on all the mags I got with no FTFs. These run without a hitch in my CMMG. Comparing them to some Metalform mags (considered the best of the best, and what Colt uses), I can tell no difference other than the Brownells mags have a different finish on them. 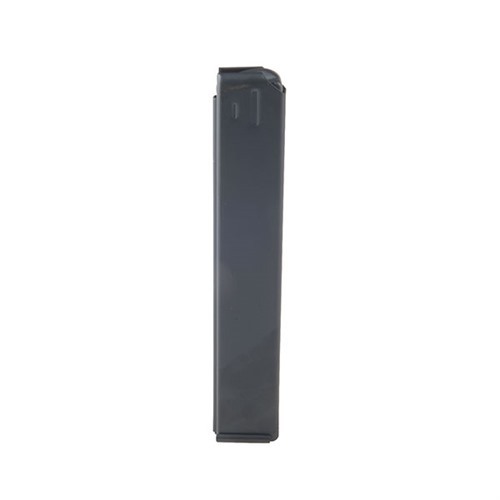 These fit, look, and function like just the factory Colt (metalform) magazines, and have a better finish. Has fed everything with no issues, including about 350 rounds of "mixed 9 JHP" that were the few remaining rounds left in the box dumped in an ammo can, over the course of a few years. I use these in my Colt Lightweight 9mm Sporter, registered as a SBR. With the finish Brownell's uses, these magazines are better than Colt factory. They feed flawlessly, function perfectly, and have held up to the very heavy use I subject them to in action/practical matches held at my local gun club. Wanted to make sure that I spread the word about these magazines. I am Incredibly pleased with them. I built a 9mm AR with the Hahn Dedicated 9mm Mag-block. All I did was put a couple drops of CLE on the bolt and let here rip. The magazines worked flawlessly. I put almost 200 rounds through it and used three different magazines. Not a single fail to feed, not a single misfire, double feed etc. I put different number of rounds in them and also loaded to full 32 round capacity to see if the spring pressure would cause a double feed. Again no problems at all. I used Federal target ammo and Winchester target ammo. Hope this information helps anyone considering building a 9mm AR. I purchased this after reading the positive reviews for a new build. This magazine was junk. One failure after another. The entire trip to the range I was only able to get two shots off at a tie one single time. My Spikes Lower receiver did NOT like this magazine at all. Inserted a different magazine I borrowed at the range and the firearm worked flawlessly. This magazine most of the time did not eject and a few times would double feed. Got one to try in a 9mm Tavor X95. Works great! I also found it easier to insert these over the IWI factory mags. Decided to try a bullpup this year in PCC divisions and will be using these a lot this summer. Test fired several magazines. This one would jam and double feed frequently.